M is the character’s name, nothing to do with the actor. He looks a bit up himself in this drawing, and trust me, he doesn’t look that way at all in the photo. I think I’ve flubbed his mouth and chin. I’m at a place in this portrait journey where I just really want to get (much) better. I want to, if anything, make people look a bit better than they do in real life, but not worse. hehe. This started as a quick sketch, turned into a drawing, then I found out the eyes weren’t straight and had to erase one and move it down. This usually doesn’t end well, but God must have been on my side this time, because it erased fine and didn’t leave smudges. 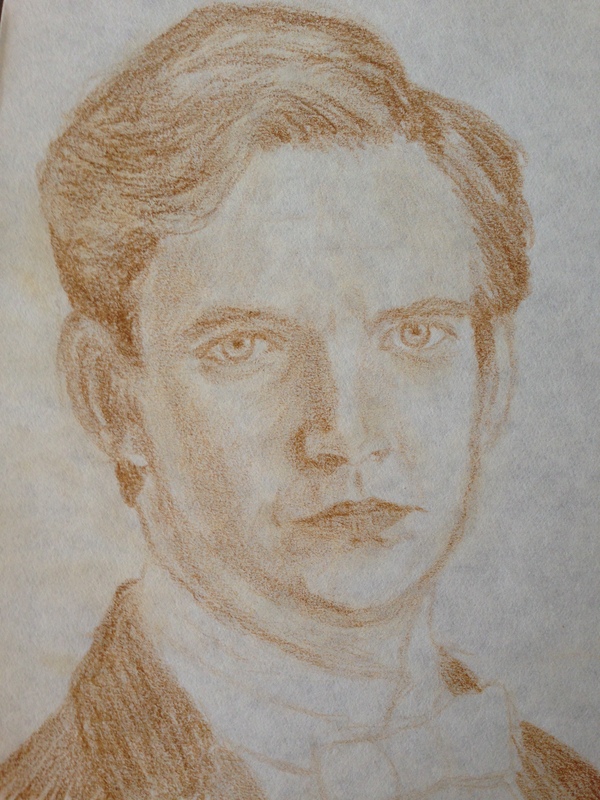 I think this brown ochre Polychromos may be my go-to portrait pencil from now on. It’s proven itself these last several go-rounds! I have another portrait planned for the letter N, but I was up much too early yesterday working, and I feel like I must be bound to crash at some point. But who knows? If the right photo calls to me (and several weeks ago, I did find the perfect photo), sleep will stay away, and sometimes I (oddly) have almost as much energy after a good drawing as I’d have got from a nap. If it bombs though…..oh, one never knows! Which is why I’d like to get much better at this….and we’ve come full circle! Happy Sunday to you. Do yourself a favor and do something for yourself today. Take a day to rest, rejuvenate, and smile, because Mama Spring has finally arrived, complete with her entourage of birds, buds, and beauty. Enjoy today, and I’ll see you with another portrait *fingers crossed* tomorrow. < L is for Lepidoptera! Poor Mary and Laura!! teeheee! AWESOME drawing! LOL! See how I am catching on?! Happy Sunday morning! Hope you get to relax today. Yes! dingdingdingdingding! You’re gonna run away with the prize at this rate! Matthew Crawley! Nicely done. I really miss him on Downton. Him and Mary were great together and I have to admit that I was a bit peeved at him for leaving the show like that, especially once things were finally working out for his character. Having a baby just seems to be a death sentence on that show. I agree completely. I miss him so much. It hasn’t been the same without him. I don’t like Mary’s storyline nearly as much now, or any of her new beaus. Very nice drawing. Sadly, I’ve seen the gentleman, but do not recognize him. I’m not surprised. Maybe cover from his mouth down and see if you do? I’m dying to redo this already. Women have guessed him correctly, though. Hub didn’t see it either. Ooh! See if Mrs Kirkistan sees him. OK. I’ll show it to her. She’s not a big movie buff, but we’ll see. Your drawing are really nice. I scrolled though a number of them. When I was young, I painted rock stars. Now I mostly do portraits of anyone. Drawing is relaxing. Thanks, Donna. It is relaxing, isn’t it? I am in love with drawing. Never thought I’d be saying that! I love the eyes. Sadly, I don’t recognize him, but I don’t watch TV either. Thank you. I feel good about the eyes. He’s much more handsome than I’ve drawn him to be! It’s a British TV show. It’s Matthew, I believe, and yes he left a big hole in the show. But the potential new love interest is quite dreamy don’t you think?